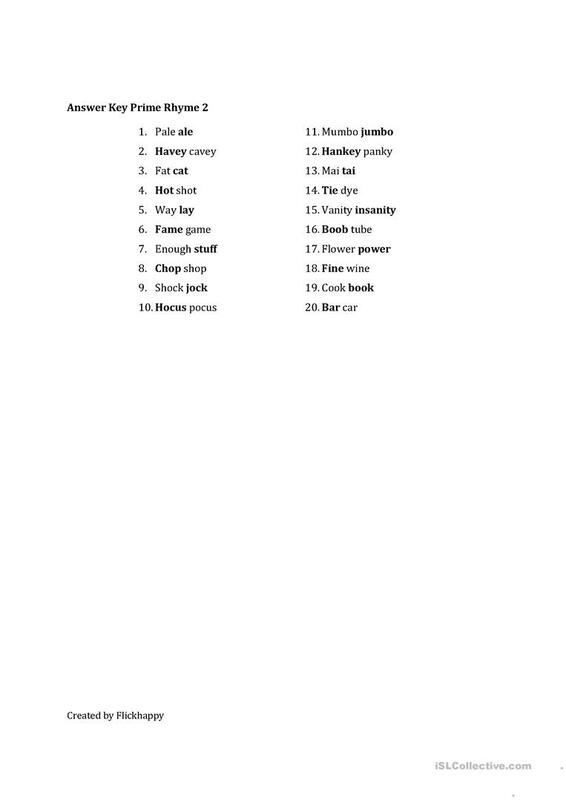 This worksheet is the second in a series of worksheets containing popular rhyming word pairs. It can be used to both to increase vocabulary and for pronunciation practice. An answer key is included. This printable, downloadable handout was created for business/professional students, high school students, elementary school students and adults at Elementary (A1), Pre-intermediate (A2), Intermediate (B1), Upper-intermediate (B2), Advanced (C1) and Proficient (C2) level. It was designed for working on your groups' Speaking, Reading and Writing skills. You will find the answer key at the end of the worksheet.